OBE awarded for services to the Administration of Justice in Scotland. She was born in Maybole and her parents and grandparents lived at Woodside next to St Cuthbert’s Primary. Johan’s grandfather was a vet, Walter Gardner, and her father was also Walter Gardner. Johan has been a Justice of the Peace since 1986 and wrote All Manner of People: The History of the Justices of the Peace in Scotland, published by the Saltire society in 2000. She was appointed an Honorary Sheriff in 1995 and in 2003 completed a Post Graduate Diploma in Criminal Justice and continues to research historical aspects of criminal justice. 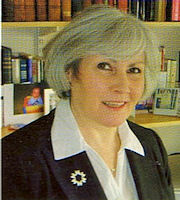 She was elected as chair of the Scottish Justices Association in 2007. Although born in Maybole, having attended Cairn Primary for a time. Johan has lived in Dumfriesshire since she was a child .